DETROIT — The Chevrolet Bolt, General Motors' Tesla-fighting electric hatchback for the masses, will be able to go 238 miles (383 kilometers) on a single charge. The car beats the base rear-wheel-drive Tesla Model S, which can go 210 miles (336 kilometers) per charge but costs about $28,500 more. The Bolt goes on sale later this year for about $37,500 before a $7,500 federal electric vehicle tax credit. It's the first mass-market electric vehicle to cross the 200-mile (322-kilometer) range, a range that will meet or exceed almost every person's daily driving needs. 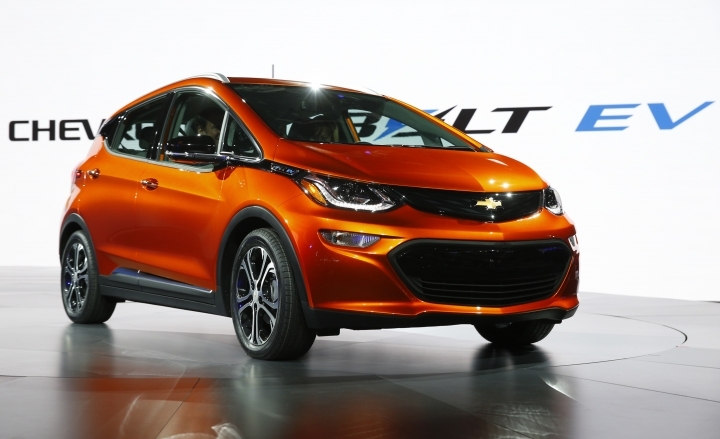 GM says the Bolt's range was determined in testing by the U.S. Environmental Protection Agency. It takes 9.3 hours to recharge a Bolt from near empty on a 240-Volt home charger, the company said. The Bolt also will be able to get software fixes over the internet, Pam Fletcher, GM's executive chief engineer for electric vehicles, said at a recent conference. Tesla's lowest-cost Model S is $66,000 before the credit. Late next year, Tesla plans to start selling the more affordable Model 3. At $35,000 before the credit, it will cost less than the Bolt and is expected to go 215 miles (346 kilometers) per charge. The Palo Alto, California, company makes cars that travel farther than the Bolt, but they come at a price. The new Model S P100D can go about 315 miles (507 kilometers) per charge, but it starts at $134,500 without the credit. Copyright © 2015 - 2019 Technology - In The Headline. All Rights Reserved.